HONOLULU – The State of Hawaii and Goa, India, signed an agreement to enter into a sister-state relationship today. Gov. 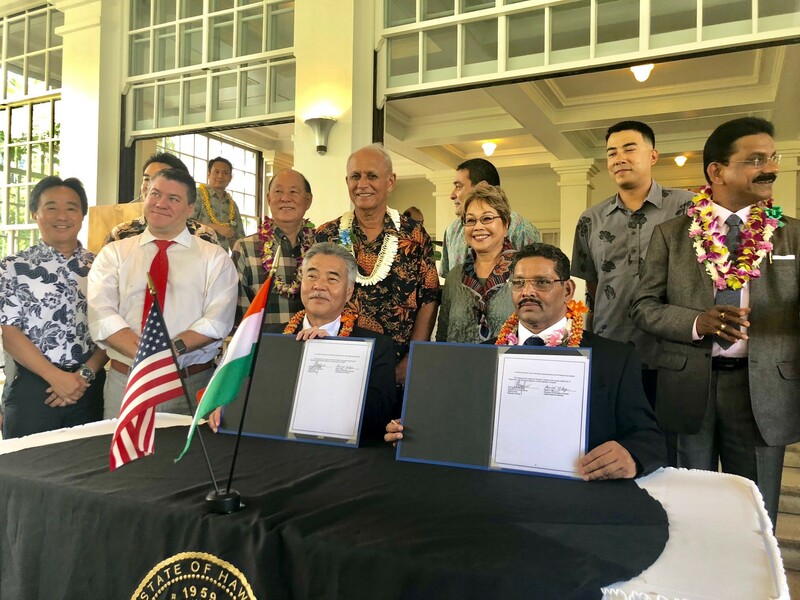 David Y. Ige, signed a historic agreement with delegates from Goa, a state in India, which is Hawaii’s first sister-state relationship with a jurisdiction in India. The Director of Art and Culture, Gurudas Pilarnekar, signed on behalf of the Goa state government. The signing ceremony took place at Washington Place. The agreement will promote trade, tourism, information technology; and exchange of health and wellness, agriculture, culinary art, education and cultural programs between private sector organizations and universities of both states. “The U.S.-India partnership is an important one, and the Hawaii-Goa relationship will help strengthen this bond. We welcome people from Goa to invest in Hawaii’s economy, and share their traditional and cultural values with us,” said Gov. Ige. Dr. Raj Kumar, President of Indian-America Friendship Council (Hawaii chapter) and Gandhi International Institute for Peace, State Sen. Brian Taniguchi and State Rep. Ken Ito were also instrumental in passing legislation for this relationship. • Goa’s per capita GDP is one of the highest in India, a country that currently boasts the third largest GDP in the world. • Goa has a growing market for US food and retail products, with imports of US agricultural food products doubling in 2015 to $20.6 million. • Goa is a top tourist population globally (7,785,693 visitors in 2017), known for its beaches, abundant seafood, tropical climate, and historic architecture, which has also attracted film opportunities. • Goa has many multinational companies with offices in the state covering various sectors like fisheries, pharmaceuticals, information technology, tourism, and hospitality. • Goa’s biodiversity is rich and is home to thousands of species ranging from plants, animals, and marine life. • Hawaiʻi’s agreement with Goa highlights the continued growth of US-India relationships, with the US-India 2+2 Ministerial Dialogue concluding earlier this month.